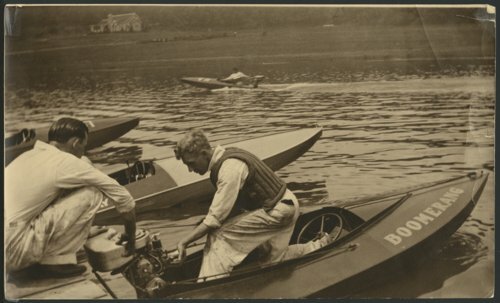 This is a photograph showing two men working on a racing boat at Lake Quivira, Kansas. The photograph was taken at the last cove on the west side of the lake looking northwest. The boat in the foreground is the "Boomerang." Lake Quivira had 900 acres of restricted residentail and recreational property.